MBChB (2006) Offering a full range of general practice services and an interest in internal medicine. 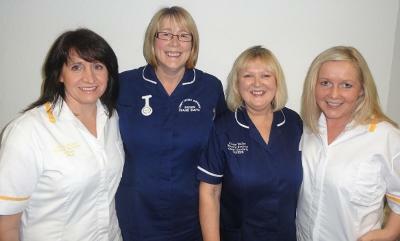 Our highly qualified Nurse Practitioners deal with a range of conditions and health concerns. They examine patients, can make a diagnosis and plan care, including prescribing medication. They are experts in many areas of disease management such as diabetes and asthma and can also carry out home visits for the patients. Left to right, Alison, Diane, Janet, Claire. Phlebotomy clinics run throughout the week. Alternatively you can book in with the healthcare assistant. There is a children's phlebotomy service run at Huddersfield Royal Infirmary, where creams or sprays can be used to anaesthetise the skin. Parents can ring 01484 342664 to book their child's appointment date and time. Secretaries produce referral letters and general correspondence. They also request hospital appointments using the NHS e-Referral system. They deal with incoming post from the hospital and update patients’ records on the computer from these hospital letters. Antenatal clinics take place on Thursdays at Croft House and Tuesdays at Marsden. Please book an appointment with midwife as soon as possible once the pregnancy test is positive. Midwives offer early screening for a variety of conditions including Down's Syndrome and early scans if needed. They will also offer guidance regarding work, benefits advice and well-being during your pregnancy. Midwives can also arrange visits to birth centres/labour ward, physiotherapy/acupuncture if needed and referrals to the consultant obstetrician.